Just when you thought people have completely denied having any responsibility for their actions, another story comes along. This time it's not a lady suing McDonald's because the coffee was hot...this time someone is suing United Airlines for making him beat his wife. Yes ladies and gentleman, fortified with Burgundy wine allegedly supplied at 20-minute intervals by United crew members during the December 2006 trip, Yoichi Shimamoto became so inebriated "that he could not manage himself," and he struck his wife, Ayisha, six times, injuring her face and upper lip as they were heading through U.S. Customs in San Francisco, the complaint said. I am not sure what is worse, the fact that he is actually blaming United Airlines, or that a lawyer actually took the case although the legal profession is constantly lowering the bar on outrageous behavior. 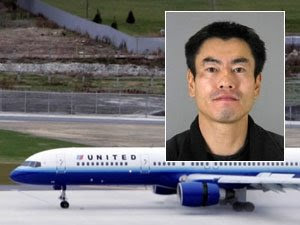 Although Yoichi Shimamoto was charged and sentenced to 18 months' probation, the couple contend that United Airlines ultimately was responsible for his violent outburst, according to the lawsuit. United's "conduct was egregious because it knew or should have known that over-serving a passenger alcohol on an international flight would have negative consequences," the complaint said. United's "conduct was deliberate, reckless, intentional and done with disregard for plaintiffs and all passengers."